GTI Club Supermini Festa is a driving game that came out a couple of years trying to seize on car simulators. Although the idea is funny, driving vehicles of series by different street circuits of some of the world’s major cities, is weaker in the graphic, something that a license of the stature of Konami, creator of sagas as powerful as Pro Evolution Soccer, should not be allowed. This time the title was developed for the Wii, the console that will work great arcade. The first thing we have to do is select our GTI from several models and the street circuit in which we demonstrate our driving skills. 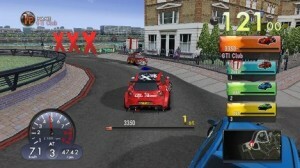 We can also choose a game mode for single or multiplayer, in which we find six ways can participate four vehicles, in addition to those provided by the machine as an annoying traffic. In races also find various difficulties, where we want to dodge the tomatoes. We will also have the opportunity to pick up objects (coins) and even participate in a curious football match between cars. We will score points and improving the features and benefits of our car, which will become increasingly more competitive compared to rivals. The control of cars is completely arcade. A level graph is not as good as it is expected from a Konami title. The cars look acceptable design but fail to improve the image of a set generally mediocre, nothing to do with the great Need for Speed. If it is ok the online game mode, which allows play the games with other players to remote level.